The first Arianespace Ariane 5 launch of 2016, mission designated VA228, is set to lift off Wednesday, Jan. 27, carrying Intelsat 29e, Intelsat’s next generation communications satellite, into geostationary orbit. This mission differs from usual Ariane 5 launches in that the Intelsat 29e will be the heavy-lift launcher’s only passenger. Liftoff is currently scheduled to take place between 6:20 p.m. and 9:40 p.m. EST (23:20 and 00:40 GMT), from launch pad 3 at the European spaceport located in Kourou, French Guiana. The mission’s nominal duration, from liftoff to satellite separation, is expected to be about 29 minutes and 52 seconds. 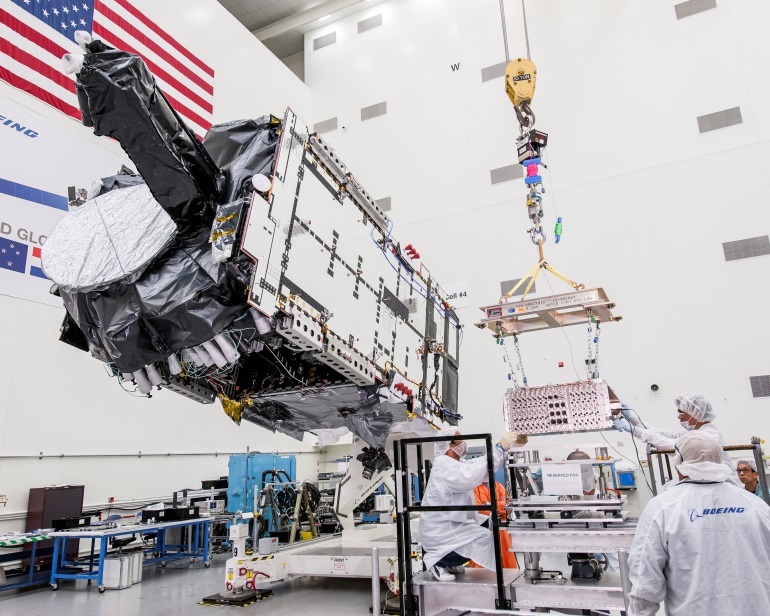 Fielding a fleet of about 50 satellites, Intelsat is working to provide high-performance connectivity services for media, fixed and mobile broadband communications. These would be used by business, government, and military customers. This will be the 56th Intelsat satellite to be launched by Arianespace, with two more Intelsat satellites scheduled to launch in 2016. Built by Boeing using a 702MP platform, this will also be the 51st Boeing satellite launched by Arianespace. Arianespace and Intelsat have a long relationship going back to the launch of the Intelsat 507 spacecraft in October of 1983. Also of note, fully half of all Intelsat’s satellites currently in operation were launched by Arianespace. The Intelsat 29e is the first in the company’s line of Intelsat EpicNG next-generation high throughput satellites and has one of the most advanced digital payloads commercially available. If everything goes as planned Wednesday, the Intelsat 29e will be inserted into a geostationary orbit at 310 degrees East. From there, it will provide between 25 and 30 gigabits per second of bandwidth for fixed and mobile customers in North and South America and over the North Atlantic maritime and aeronautical routes. To provide these services, it will utilize its high throughput 20 C-band transponders and 249 Ku-band transponders, and its 450 MHz Ka-band transponders to provide global coverage. The mission was given the go-ahead on Monday, Jan. 25, following a successful launch readiness review. The massive 179-foot-tall (54.8 meters) Ariane 5 rocket was rolled out to the Ensemble de Lancement Ariane 3, or ELA3, on Tuesday, January 26, and promptly fitted to the various communication arrays, sensors, and fuel pumps at the pad. The Ariane 5 ECA is two-stage launch vehicle that is comprised of the Etage Principal Cryotechnique (EPC) – Cryotechnic Main Stage – which is powered by a Vulcain 2 rocket engine, and two Étages d’Accélération à Poudre (EAP ) solid rocket boosters. The two EAPs are capable of generating a total of 2.43 million pounds-force (10.8 MN) of thrust – 92 percent of the thrust required to carry out the mission. The upper stage of the rocket is comprised of the Etage Superieur Cryotechnique (ESC) – Cryogenic Upper Stage – powered by an Aestus rocket engine which is capable of being restarted. The upper stage also houses the Vehicle Equipment Bay (VEB) which will carry Intelsat 29e in the SYLDA payload carrier. The launcher will be carrying a total payload of 14,771 lbs (6,700 kg). This mission marks the first in a busy year for Arianespace, as the company sets an objective of 11 launches, including as many as eight by the Ariane 5.